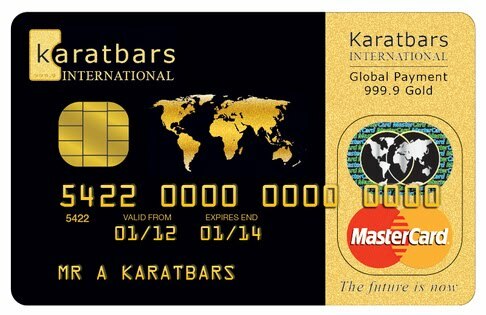 Karatbars will accelerate your cash flow enabling you to eliminate debt while creating inflation-proof savings. And, it's all possible in an affordable, easy to use, transaction-friendly format. And it's free to register. Start your own Gram Savings Plan today! 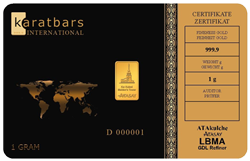 This is the beautiful 1 gram card available from Karatbars International. Cards are also available in 2.5 and 5 gram amounts and are shipped via FedEx or, if you choose, you can store your gold at no charge. This is one of the first Collector cards offered by Karatbars International. 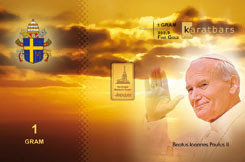 In a licensing partnership with the Vatican, this Pope John Paul II card was created. It has sold out and was so popular that a second agreement has been reached to produce a new offer.